Advocates for more road funding in Michigan say there’s still hope to find a solution this year, even if it’s just a partial solution. Governor Rick Snyder recently told the Associated Press state lawmakers are unlikely to approve a comprehensive plan for roads any time soon. He originally proposed raising vehicle registration fees and the state’s gas tax to boost road funding by more than a billion dollars a year. But Snyder said the Legislature could still take a up a plan to change the way the state taxes fuel. He hopes lawmakers will at least consider switching the state’s per-gallon fuel tax to a levy on the wholesale price of fuel. He said that would at least keep funding stable as gas prices rise and people use less fuel. John Niemela is the director of the County Road Association of Michigan. He said he thinks a more measured approach to the issue could still yield results. “While it may not be the approach that we like the best, looking at some of the other alternatives, at least to keep us in that dialogue and process, has the potential, at the very least over a period of time, to start looking at some modest increases in funding,” said Niemela. He said lawmakers realize they can’t avoid the issue much longer. There’s also a possibility the state Legislature could ask voters to approve raising the state’s sales tax to pay for road improvements. That could also be coupled with increased funding for public schools. But that’s not likely until at least May next year. Travel on Sugar Island is said to be “significantly impacted” today as seven roads suffered major wash outs. A deluge of rain Monday night, five inches in five hours, damaged many of the island’s main roads. Early damage estimates are being put at well over a million dollars. More than half the island’s homes are cut off from the rest of the island. McKee said huge culverts were destroyed, road gravel was washed into garages and at least half a dozen main roads have large sections completely washed away. 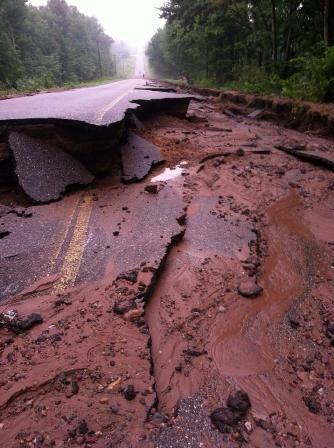 Emergency officials are asking people to stay away from Sugar Island while road repairs are underway. The International Bridge, connecting Soo Michigan to Soo Ontario, is considering a rate hike that would take effect next spring. Tolls would increase by 50 cents per vehicle next year under the proposal, and by another 50 cents in 2019. The bridge authority also wants to implement a loyalty program for frequent crossers. People crossing the bridge more than eight times a month would receive a 30 percent discount. People crossing two to eight times a month would receive a 20 percent discount, and those crossing once a month would get a 10 percent discount. Public meetings are scheduled to discuss the proposal. They’re in Lansing on September 4, Soo Ontario on September 10 and Soo Michigan on September 11. MBS International Airport in Saginaw County has received over one million dollars in grant money, mainly from the FAA, to help fund runway and terminal improvements. Officials said the money will be used to reimburse the airport a couple of recent upgrades; on to improve the security access control system and another upgrading the system that shows passengers their flight information. Jeff Nagel is a Airport Manager at MBS International. “It’s worked out very well. The security system, it works out very well. It’s all computer-access control system with card readers, photo IDs and what not. And we have various areas in levels set up throughout the building. It’s worked out very well for our tenants,” Nagel said. Nagel said there’s roughly $180,000 dollars remaining from the grant. That’ll be used to repaint runway markings. All the work associated with the grant is expected to be complete by the fall. A Traverse City airport has received federal funding to help lengthen its main runway. The $3.2 million grant was awarded to Cherry Capital Airport by the Federal Aviation Administration. Kevin Klein is the Director at Cherry Capital. He said the weather has an impact on the weight of the plane and how it flies. “We have a fixed runway length, which is 6,500 feet. So the hotter it is at full capacity, which is what they try to achieve to flyout, with the hot air, they need more runway length. So what they do so they know that they have the fixed runway length, they have to reduce the weight of the airplane,” Klein said. Klein said currently up to half-a-dozen passengers may be bumped from a flight to reduce the total weight. Construction on the new runway has begun. It’s scheduled to be ready for use in December. Earlier this year in his State of the State Address, Governor Rick Snyder said Michigan needed to spend an additional $1.2-billion on roads each year, or risk them falling apart even more than they already have. But the new funding never came through. So what does that mean for Michigan’s roads in the busiest travel and construction season of the year? It’s well known that Michigan’s roads are deteriorating. And with limited funding available, it’s getting harder and harder to set road funding priorities. State Representative Peter Pettalia represents parts of northeast Lower Michigan. “We have many roads that are in good condition, many that are in fair condition and many that are in poor condition so what do we do with the money we take in? Do we go to the poor condition roads and try to put a band-aid on them? While the good condition roads drop down to fair and the fair condition roads drop down to poor?” Pettalia said. Part of the problem is in the funding mechanism for Michigan roads, it’s a per gallon tax on gasoline. As cars become more fuel efficient, fewer gallons are being purchased, which means less funding for roads. Anita Richardson is a spokesperson for the Michigan Department of Transportation. “We haven’t updated investment in our roads since the gas tax was adjusted in 1997. We’re losing about 3 million dollars a day, just in terms of lost maintenance and wear and tear on the roads,” Richardson said. Several bills have been introduced to address the problem, but so far, none have gained traction in Lansing. And it seems unlikely that any will come up for a vote before the end of the summer.